Audiobooks from VoxClub is the best choice for audiobook lovers! What is VoxClub? It is a huge library of audio books in which a reader with any taste can find and download a useful book. The VoxClub card file has classic Russian and foreign literature, science fiction and fantasy for the fans of the genre, detective and historical novels. VoxClub has sections devoted to foreign languages, applied psychology and business for those who like to learn with the help of audio books. There are simply useful books: reference books, dictionaries, encyclopedias and various collections with information on any topic. For five years the application “VoxClub Audio books” has been developing, improving its implementation and most importantly the amount of its audio books increases every week. The VoxClub library has more than 5000 various books, collections, encyclopedias and reference books! One could get lost in this diversity, but each audio book in VoxClub is in one of more than 25 sections. It is quite easy to find a book: either use a special feature of search by title or author, or find the required file in the appropriate section of the card file. 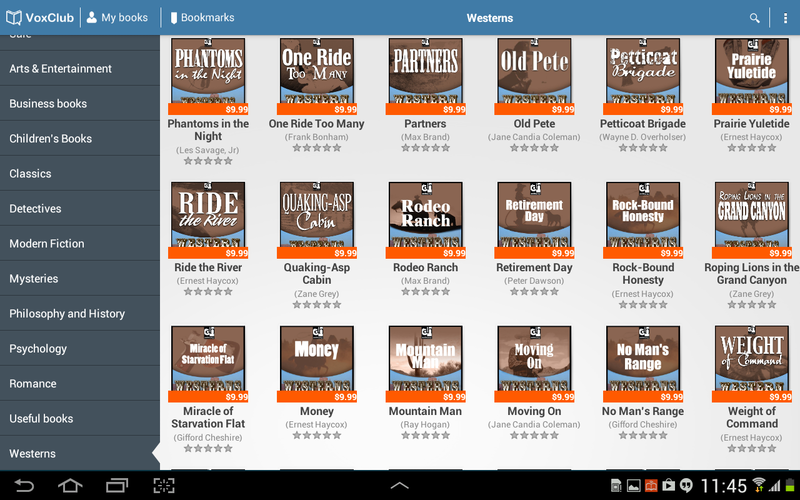 The range of books for the users of the VoxClub application is constantly growing. New volumes and opuses are constantly added to VoxClub; one can learn all about the latest updates in the special section “What’s New”. Special attention should be paid to the “Hits” section. According to its name it includes only bestsellers. 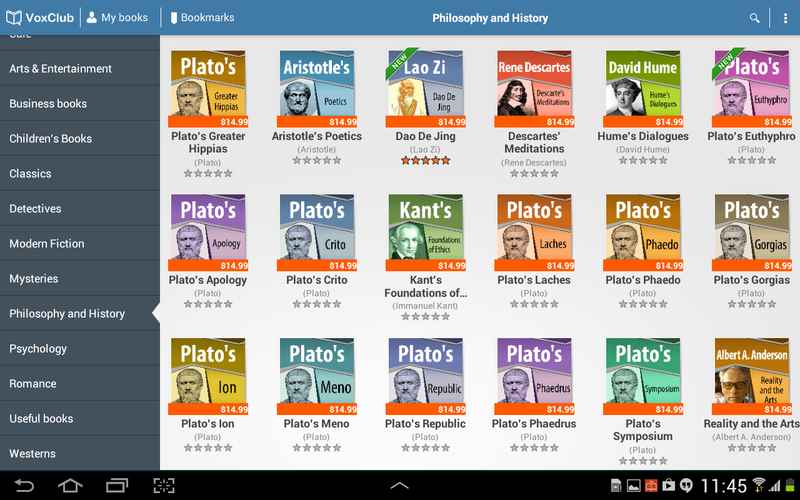 This very section of the application includes the books which have become bestsellers. These are works by E. L. James D. Brown, Boris Akunin, autobiographies of celebrities and millionaires, as well as business literature and books on psychology which have proven their efficiency. The VoxClub Company creates audio books in collaboration with the best publishing houses and authors that is why all the best publications which can be offered in the book market quickly appear in the card file of the application. The prices of audio books remain reasonable, and even the most popular books can be bought at an affordable price. Besides this, the users of the VoxClub application can buy audio books at record low prices on a permanent sale. The choice of the offered books will catch the interest even of the most discerning readers. On sale one can find classic works, new psychological research and educational encyclopedia. Even if you are experiencing temporary financial difficulties, you can always choose a great book to listen to. Advantage of being registered at the VoxClub site. Each new application user gets access to the personal account, which stores all the information about downloads and already downloaded books. At any time you can restore your purchases with neither additional costs nor expenses. If you have changed the gadget, updated the system or just decided to listen to the book with another device (not necessarily running under Android), you will not have to spend money – just use your account and the history of your downloads. The most popular question among the users of any library application is whether it is possible to download books for free? In VoxClub it is possible! Even last year, the application developers have announced a unique campaign for the registered users: access to the “Free Books” section, which is constantly updated. Do not forget to visit this section and collect your free library. 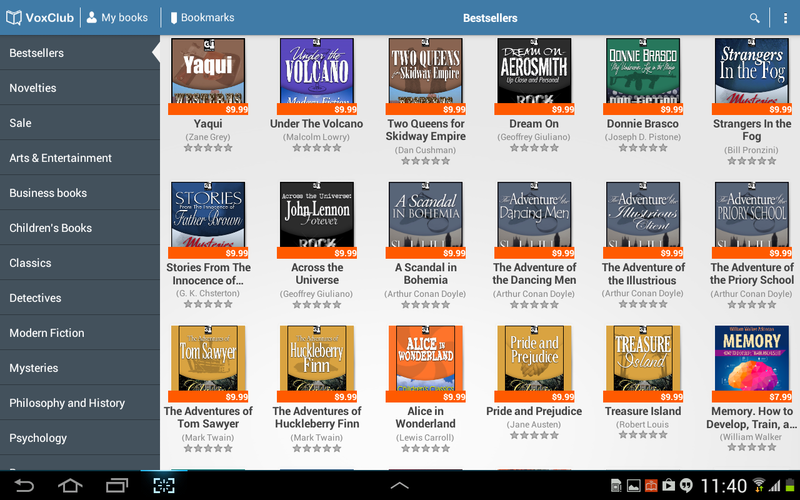 A decent and easy to use application “VoxClub Audio books” really deserves to be installed. After all, there is no other way to have more than 5000 audio books in your pocket!